Note the chart below. Thoughts? 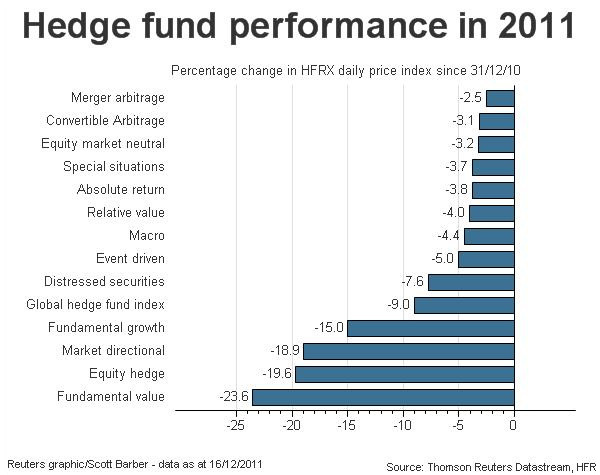 Hedge Funds are a better deal for the fund managers than the clients. Buyer beware. I owe several of you replies to your questions. Bear with me as I finish reading the Wal-Mart and Global Crossing Case Studies. I spent about 3 hours yesterday catching up on posts from your site that I had saved in my Google Reader over the past month. I am not sure how to describe my feeling right now besides to say I was enthralled and inspired. Your website is like finding a value investor pirate’s secret treasure trove on a deserted island. There is such a wealth of material and information and it’s all such high quality thoughts that I kept thinking, “Who the hell is this guy?” Attempts to dig into posts related to answering that question yielded several tantalizing details but the mystery remains. Are you currently or were you an MBA student? I am trying to figure out where these lecture notes are being pulled from. It says “auditing classes from 2001-2007″… that’s an awful long time and the institution and role of the note-taker are left unsaid. I get you’re trying to focus on quality, not reputation, a worthy goal, but I am fascinated simply from the stand point of why I am suddenly able to access all of this information, for free. It doesn’t really matter, I am just curious, that’s all. My replay: Thanks for the kind words. I have never been an MBA student. I worked on Wall Street as a broker and investment banker before starting a few companies here in the US and Brazil. Upon selling those businesses, I sought to dig into value investing. I saw that the author of a value investing book was teaching at Columbia Business School so living in Greenwich, CT–only 45 minutes from the campus–I hopped the metro train and sat in on his class. The first class was around 1999, when his students would regularly laugh at the idea of valuing companies when all you had to was buy Price-Line or Yahoo and see the price rise five percent in an hour. All I had to do was sit in the back and keep my mouth shut. Now, I think Columbia is touchy about outsiders sitting in on classes. But you really don’t have to do what I did. You just need to read, read and apply your independent thinking to investing. Look how Michael Burry learned (See the Big Short by Michael Lewis or search this blog). But, I do believe that becoming an “expert” or skilled investor probably takes 5 to 20 years of intensive commitment. Of course, you never “master” investing which is why the journey is fascinating. Also, several great investors have confirmed my belief that the best way to learn about value investing is through your own efforts and application of principles that you will learn through Buffett, Fisher, Klarman, Graham and your accounting textbooks. There are a lot of dead ends and wasted time if you do not know the proper principles and methods for investing. The investors work alone. Any group decisions for Buffett or Walter Schloss? They make their own deicsions, and they are little influcned by any form of group affiliation. Buffett said of Walter Schloss: “I don’t seem to have much influence on Walter. That is one of his strengths: nobody seems to have much influence on him.” Ditto for Michael Burry. These terms originate from a remark attributed to the Greek poet Archiloschu: “the fox knows many things, but the hedgehod knows on bigf thing.” Foxes are eclectic, viewing the world through a variety of perspectives, with no allegiance to any single approach. READ WIDELY and not just on finance and economics. Understanding how markets work is more important to an investor than understanding technology (trading systems). Few great investors are overnight successes. Many have to overcome failure. Money is about freedom, not consumption. They enjoy the process, not the proceeds. Note that Michael Burry accumulated his investment knowledge gradually, from his own experience and from reading others’ experience via bulletin boards, rather than from finance textbooks. (Hint: study the www.valueinvestorsclub.com or www.yahoo.com finance boards of intelligent contributors). Successful investing is a practical craft, not an academic discipline, and certainly not a science. The craft of investing is comprised of heuristics: a toolkit of approximate, experience-based rules for making sense of the world. (See the book: FREE CAPITAL by Guy Thomas). I have the material so I might as well post for the 20 or so hard-core students who will wish to use it. Many talented investors helped me, so giving back is my responsibility, though sharing this material helps me as much as anyone. I do not expect many readers because few people are suited for long-term, intensive self-directed learning. There are those who are already in the business who think they already know everything; others seek a conventional route of the MBA; while some want investment ideas/tips–not theory, case studies and practice. I wanted the material on the web for easy searching and access. Secondly, many people have made excellent contributions to the value vault. Like the quarterback who hands the ball off to the running back who then runs 98 yards down field while breaking 7 tackles and leaping into the end zone, I receive too much credit. Thirdly, interactions with curious readers help keep my thinking sharp. I have a friend who has been working on developing a grass-based, intensive rotational grazing miniature farm on an acre of land about an hour north of Los Angeles, California. He looks at all the reading, time, energy and money he has spent on this project so far (and in the future) as the cost of acquiring a “personal MBA in agriculture” (yes, he gets that agriculturalists don’t get MBAs, but he’s approaching this project from the mindset of a businessman). When I read through your site, I realize I could do the same thing using some of your material, as well as other blogs I follow and various recommended readings, as a launching point to pursue my own “personal MBA in investing” over the next 12 mos or so. The focus on case studies, and the ability to directly apply my learnings to my own small portfolio in real-time provide the perfect means to make real-world application to the theory being taught in the “classroom.” I think this is a big idea and I am very excited as I consider it more and more seriously. I plan to blog my entire journey and produce various supporting course materials along the way (such as reading list, top blog posts, favorite video lectures links, etc.) as well as keep a running tab on costs, so at the end of it all I can show other people what I learned and how much it cost to get the knowledge. Yes, use the material how you wish. Start a study group and work on several of the cases. Eventually, there will be sections on special situation investing, competitive analysis, valuation, Austrian Economics. Or you can take a case study and develop it further. Seek higher; you can also sign up for courses at the Mises academy (www.mises.org) or go to www.thomasewoods.com to learn about Austrian economics. I want to thank you again for the resources you place on your site. I’ve only just begun to dig into them and it may be some time before I begin actively participating in your site’s discussion but I do think it’s wonderful already. My reply: I became interested in Austrian Economics because Rothbard and von Mises had the only coherent theory and explanation for booms and busts. But as I studied fruther, I learned more about the structure of production and time preference which helps you understand the risks in different businesses. Every wonder why a steel company fluctuates more in earnings and price than a beverage company? The distance from the consumers in terms of time and production structure. Look at your watch. How long did it take to make? Two hours? Well, who mined the sand to make the glass? Who mined the metal to make the case? Who killed the cow to make the leather wrist-band? And who planned all the production? Perhaps your watch took two years from the moment of assembly to the first production of the materials. You need to understand this if you EVER invest in a highly cyclical company–what company isn’t at some level cyclical? Okay, that’s all for now. Thanks for sending the link to the Value Vault. Where are you located geographically, generally speaking? East Coast, West Coast? Big city, small town? I live in Greenwich, CT home of many hedge funds, but I have never been to one.